The Enriched Virtual model allows students to complete the majority of coursework online at home or outside of school, but attend school for required face-to-face learning sessions with a teacher. Unlike the Flipped Classroom, Enriched Virtual programs usually don’t require daily school attendance; some programs may only require twice-weekly attendance, for example. The Enriched Virtual is considered a disruptive blended-learning model because it transforms the student learning experience beyond just adding an online-learning feature to a traditional classroom. In the case of the Enriched Virtual, online learning is the backbone of learning, enhanced by a brick-and-mortar component that is distinct from the traditional classroom. Many early Enriched Virtual programs branched off from full-time online schools by providing nontraditional students with more structured support, face-to-face enrichment, and a safe, peaceful brick-and-mortar setting. Aiken Virtual Program, part of the Rapides Parish School District in Louisiana, is one such example of an Enriched Virtual program that is geared toward nontraditional students. 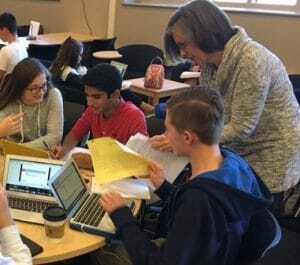 Downingtown Ivy Academy, part of the Downingtown Area School District (DASD) in Pennsylvania, however, represents a different cohort of Enriched Virtual programs that provide mainstream students with alternative options to take required courses. Both programs have grown to serve students in grades 6 through 12. The BLU recently chatted with Jenifer Scott of Aiken Virtual and Kristie Burk of DASD to gather insights on the benefits and challenges of implementing an Enriched Virtual. BLU: How did your district’s Enriched Virtual program get started? Scott: We began with a trial of three courses in the spring of 2010. Then, we formally opened the program with summer school offering credit recovery. The goal was a virtual program that could meet the needs of our high school students to help them stay on pace for graduation, be eligible to play sports, or get ahead and graduate early. We’ve continued offering summer school each summer since then and we’re increasing the number of enrollments every year. Burk: We launched blended learning in 2014 with an Enriched Virtual model. The biggest difference with blended learning for us is not the face-to-face time—which is still very traditional—but the time that students spend outside of the classroom. On days when there is not a face-to-face class, students can see their blended teacher for extra help, go to the library, work in the cafeteria [renovated with flexible study and collaborative spaces] or the school’s cyber cafe. 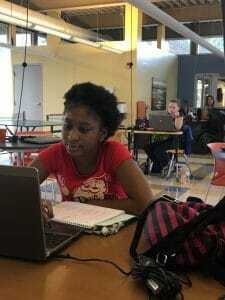 It’s a collegiate environment. BLU: What’s one piece of advice you’d offer districts or schools hoping to kickstart a similar blended-learning model? Scott: I think new blended-learning programs should start small and use information obtained from similar programs to make growth less painful. Talking to or visiting a program that’s similar to what you want to create is very beneficial to get ideas about where problems may pop up that you wouldn’t expect. Burk: I would suggest that leaders do not underestimate the amount of PD that is required to make sure that teachers are prepared and confident in teaching in a blended environment. BLU: What does PD look like for your blended teachers? Scott: All new blended teachers are assigned to a mentor. That mentor is on faculty and in a similar content area. The two teachers will work side-by-side for first couple of weeks. Then, they stay in close communication during the semester. All of teachers use Padlet to share notes and participate in peer observation—not as evaluation, but just to learn from each other and get ideas on how to improve. We give them more opportunities to have informal conversations but also hold data team meetings every other week to sit down and talk about students’ progress. Teachers also use online courses for PD with GradPoint. Burk: We provide two full years of PD to our blended teachers. Teachers who volunteer [to make their courses blended] work together for the first year of PD. Our PD is blended, which means that teachers are enrolled in a Schoology course and participate in online discussions, collaboration, and research assignments. This way, teachers really experience what it’s like to be a student in a blended class. In person, we practice different blended models, like the Station Rotation—there may be a group in direct instruction on how to use edtech tools and another group collaborating to read and present blended-learning research or case studies. We’re learning and practicing. Teachers also have a lot of development time to build lessons during training. They say this is the best PD they’ve had. For the second year of PD, teachers are part of a support group to improve upon what they’re doing. This network includes peer observation and feedback in the classroom. BLU: How does the program support students to help ensure that they succeed? Scott: The program has a brick-and-mortar building in the district with 10 full-time teachers. We’re open all day for students to come in and get help. Recently, we changed our daily schedule, so we’re now able to start earlier and stay later to meet the needs of our part-time students. Students who are enrolled in their first course in the program are required to do a face-to-face orientation. Otherwise, they can work from home for most of the semester [if they are not struggling]. Our teachers visit each of the district schools every few weeks to meet face-to-face with students while they’re working with online classroom facilitators. We talk to them about their progress, share concerns, and answer questions. We need to give them supports like this to make it work. Students and parents may also contact the teacher at any time now that we use Google Voice to open up easy communication. Burk: Teachers are always in their classroom, even during “blended” periods when students don’t come in. Students can use that period to go see their teacher and get individualized help. We also updated the blended course schedule so that there is a 50/50 split between online learning periods and face-to-face class periods, which has been much more successful. Students tell us the blended program has really helped prepare them for college schedules and given them skills they’ll need for higher education. There are nearly 60 schools and districts on the BLU using an Enriched Virtual model. To see more examples, search the BLU directory by model type. Learn more about different blended-learning models on the BLU’s newly redesigned models resource page. « Will blended learning fulfill its disruptive potential?